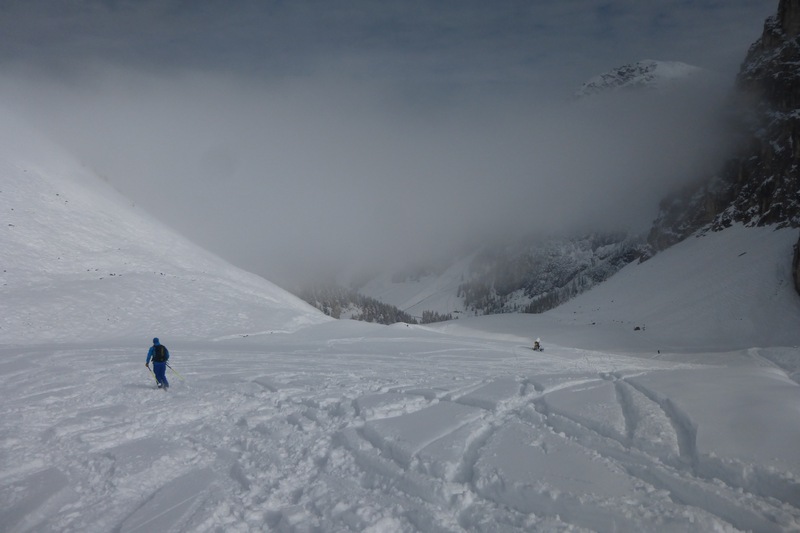 Friday thought #83 Early season skiing – making the most of what little snow we have! So I hear that North America is getting a huge amount of snow at the minute, however sadly this is not the case here in Europe. 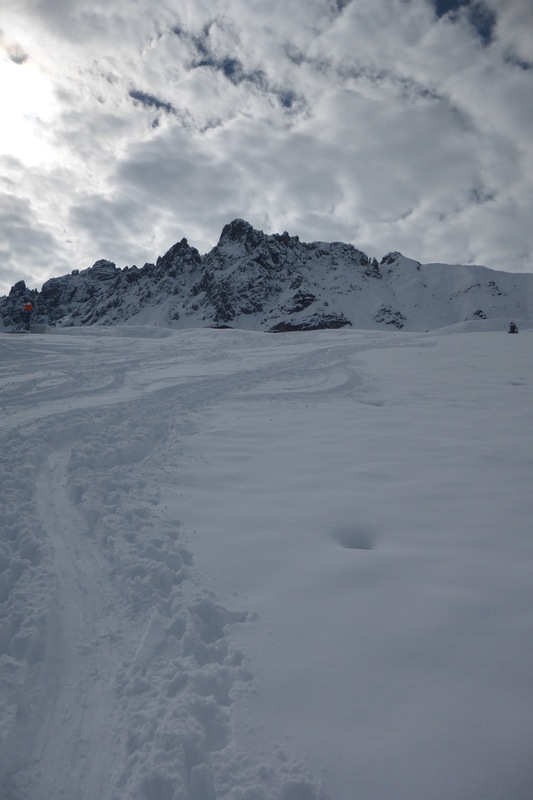 Winter teased us back in November and as ever the snow canons were blasting 24 hours a day, a few meagre pistes were opened and skiers hit the slopes in their droves. But since then we have had literally no precipitation, just bright blue skies, sunshine and well below freezing temperatures. So I can’t complain, this weather is gorgeous, and we have been determined to make the most of what we’ve got. Those in charge of the ski areas have done a superb job of getting resorts open, and the cold temperatures have helped the manufactured snow stick brilliantly, so with zero off-piste or back-country touring potential, why not make the most of the magnificent sunshine and the spectacular ‘half Autumn half Winter’ scenery and hit the pistes?! Very respectable coverage considering we’ve had no snow! A 14km track leading from Austria to Switzerland. I love popping over the border for lunch! When you get tired of the pistes, why not have a go on the airbag? Friday thought #58 A kindergarten with a view! I teach English a couple of mornings a week in a kindergarten here in Innsbruck, which just happens to be at the top of quite a high building, meaning that I get the chance to see the sun come up over the mountains early in the morning. With this stunning Autumn/Winter we’ve been having so far, I can’t fail to appreciate that this has to be among the top 10 best views of any kindergarten in the world??! Shame the 4 year olds probably don’t have quite the appreciation I do! So last weekend we decided it would be fun to try and climb the Großglockner, the highest peak in Austria at 3798m. The weather was still warm, autumn colours still beautiful, the weather forecast good, and surely the route or hut wouldn’t be busy in the second week of November…? After a 3 hour drive from Innsbruck, we parked up and set off on the 2 hour hike up to the Stüdlhütte at 2801m. We hiked the last section in the dark via head torch and arrived around 6pm to find to our delight that the winter room was empty. Fantastic, maybe Saturday it would be busy we thought, but clearly people were at work on a Friday so didn’t have time to get up there, lucky us. The hut’s winter room even had electric lighting and a long drop toilet, what luxury! 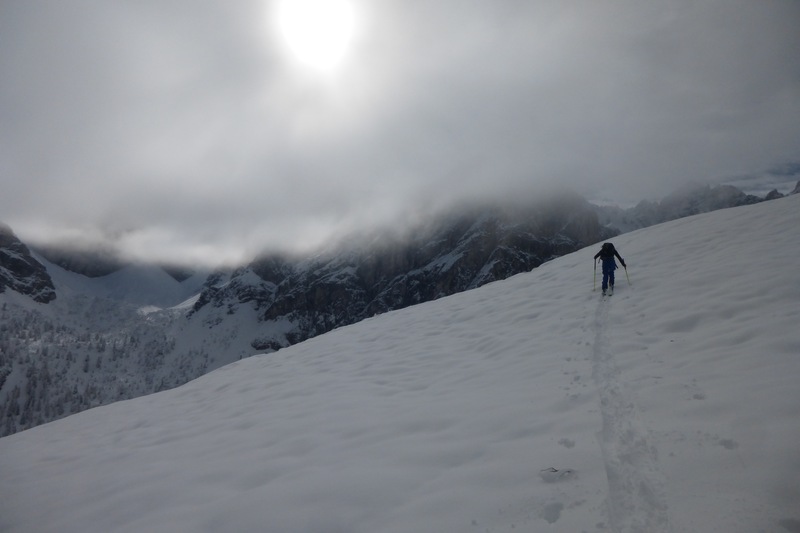 We melted snow, cooked our dinner, and generally enjoyed the peace and solitude of being alone at almost 3000m metres, then intending to get up around 5am to head for the summit, we settled down in the 14 bed dorm on our own around 9pm. However this signalled the end of the peace and solitude. At 10.30pm we woke to heavy boots and loud voices. 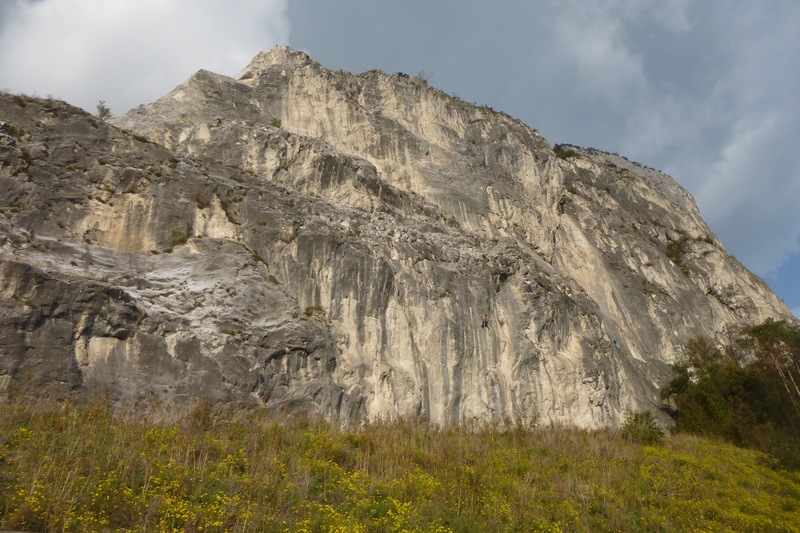 We scrabbled up confused, to meet 2 Slovenian climbers arriving, and telling us ‘there were more coming’. And so it began, from then until 3am, more and more climbers arrived; thumping up and down the stairs, slamming doors, unpacking their bags in the middle of the dorm, shuffling around in noisy goretex, waving torches around, and communicating at the top of their voices. One group even cracked open cans of beer and started having a party at 1am. There was no chance of sleep, yet worse than that was the utter confusion as to where these people were coming from. The walk from the car park was only 2 hours, so these people must have left well after midnight. Why? Added to this, the wind was picking up outside to the point where it could only be described as howling; indeed the small winter room building had started to violently shake. By 5am we had had enough, it was time to get out of there. Looking around as we left, every bed in the dorm was full with people attempting to sleep, and every spare patch of floor and bench was covered in bodies, there must have been 25 people in the tiny wooden hut. And of course the group of Slovenians banging around shouting and laughing at the top of their voices. Where had they come from and why so late? There’s a question which will continue to baffle me for evermore…! We battled our way down by head torch through the howling wind, finding it difficult to drag our thoughts away from sleeping. It was such a shame we couldn’t climb the peak, but all we could think about was getting away from those people! It really did make me question what goes through people’s minds when surrounded by sleeping bodies in the middle of the night. If I arrive somewhere late at night I creep around and do everything I can to avoid disturbing anyone. I am aware that 2am is an unsociable time and I try my best to not annoy or bother people. I foolishly thought this was fairly logical, yet I’m starting to think I may be in the minority. 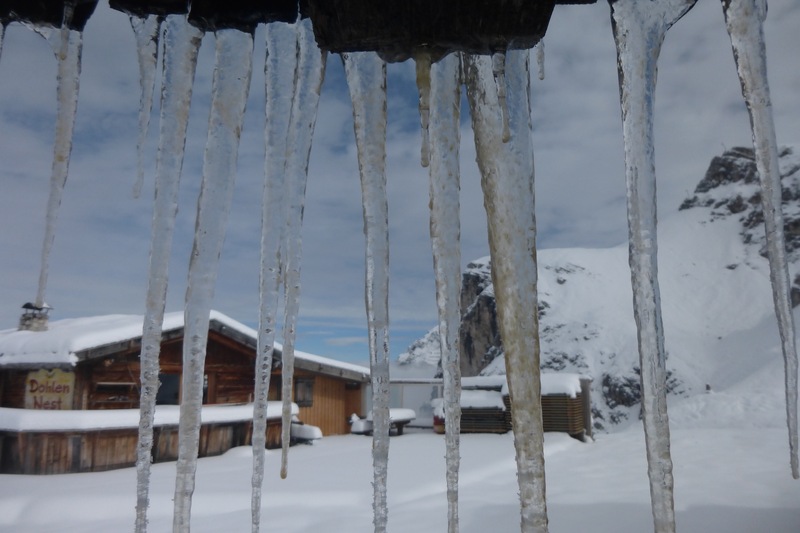 We would still like to climb the Großglockner, but I think next time we’ll avoid the hut…! 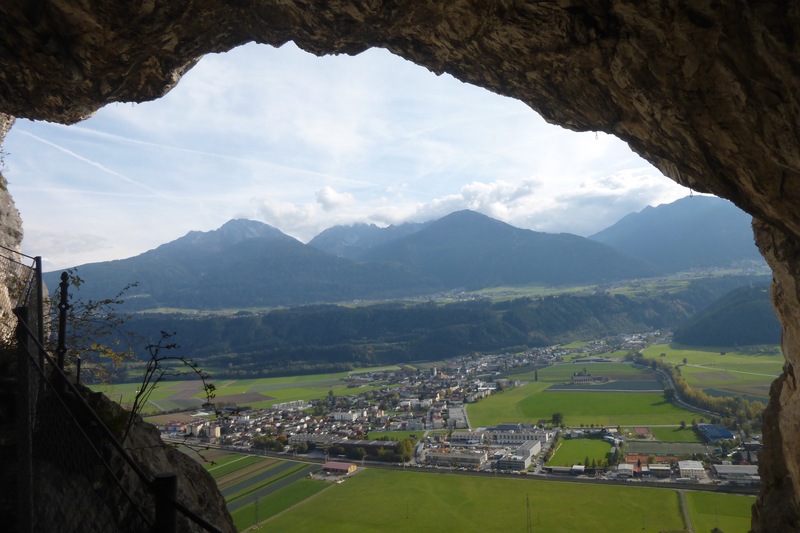 Innsbruck is a wonderful place. Where else in the world do you have stunning mountains and all the nature you could wish for, within spitting distance of a city with all the amenities a person could ever need? The seasons are changing fast here, the bright orange and yellows are out in force and the colder weather is creeping in, which means Winter is coming…! But not quite yet. 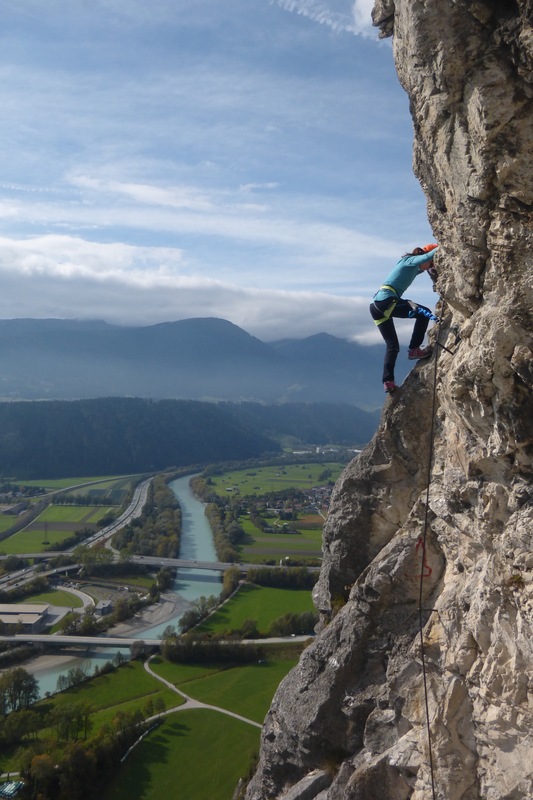 Last week we managed both a via ferratta (climbing rock faces using fixed metal railings) and a ski tour within a couple of days. Perfect! Powder in October??! Who’d have thought? !